We’ve covered stress many times here. But just like anything that needs regular maintenance, stress should be addressed regularly. Why? Because in the fast-paced environment called life, we can often forget to take a minute to stop and smell the daisies. Stress can more often than not end up dominating our lives. At that point it becomes a serious issue. Ayurveda believes that stress can have a direct impact on a person’s life, leading from disorders like anxiety to constipation, dizziness to heart disease. As can be expected, this can lead to interpersonal issues as well. It is therefore important to understand how to combat stress in our modern lives. Ayurveda suggests that stress needs to be examined on an individual to individual basis. To tackle stress, Ayurveda adopts a series of practices. Ayurveda suggests that gunas (attributes or qualities) exist in the environment. Understanding how these gunas affect an individual’s predisposition allows for an Ayurvedic doctor formulate a treatment plan for the person. Above listed are catabolic and anabolic gunas. They are responsible for reducing and building respectively. Balance between these gunas ensure balance in the system. Too much or too little of these gunas can cause imbalances in a person’s dosha. 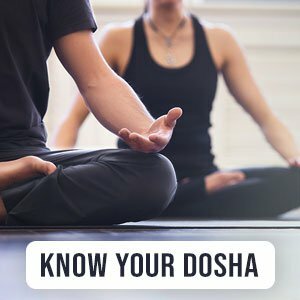 To find out your dominant dosha, take our quiz. Stress falls under an imbalance in the catabolic gunas category. Under ideal circumstances, the ability to reduce these stressors would lead to less stress. But we cannot control every stressor. Treating stress in Ayurveda, as mentioned before, is a holistic process. Incorporating practices such as supplementation and lifestyle changes are your keys to stress relieving techniques. When looking to manage stress with herbal products there is one herb that stands out. This Ayurvedic stress relieving tablet also comes in a powdered form but to make things easier consume this once a day or as prescribed by our doctors. What is it? Ashwagandha. Ashwagandha is a powerhouse supplement that is commonplace to Ayurveda. It can help decrease cortisol levels in your body. Cortisol is commonly referred to as the stress hormone. It is also known to decrease blood pressure and increase energy levels and even strength. Find ours here. There are several lifestyle changes to make that can help alleviate stress. Firstly, let’s start with things you can stop doing.